Last night, we ventured to Raleigh to attend a book signing of one of our favorite authors, Christopher Moore. Moore spent the first hour at the podium, riffing on current events, death, growing old, and death, before signing books and chatting one-on-one with the hundreds in attendance. Quail Ridge Books has tons of books, book clubs, and tons of stuff for young readers. And they also have lots of great book signings. They've had David Sedaris. The Fonz. Kim Harrison. Weird Al. Jimmy Carter. Paula Deen. Gene Hackman. Mike Huckabee. Chelsea Clinton will be there in November. 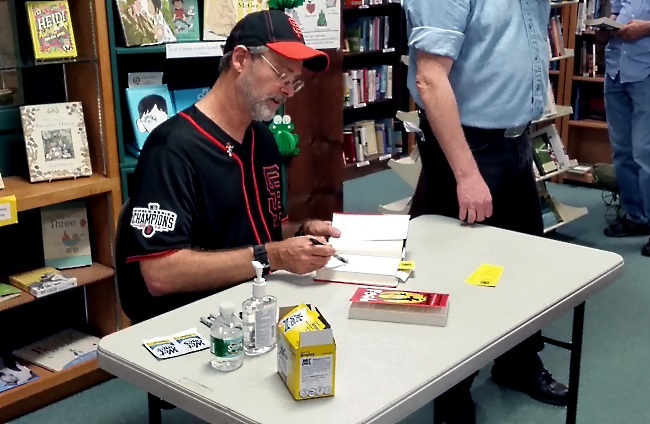 Much thanks to Quail Ridge Books for bringing Christopher Moore to town and putting together another successful reading and signing. Quail Ridge Books is located in the Ridgewood Shopping Center at 3522 Wade Avenue in Raleigh. If you drop by, tell them Strange Carolinas sent you. But they'll have no idea what the hell that means.